In West Virginia, students that would normally be constructing birdhouses or bookshelves are instead contributing their labor and newly acquired skills to help give those who lost everything a new start. Last year, historic floods devastated the state, destroying over 5000 homes and killing over 20 people. 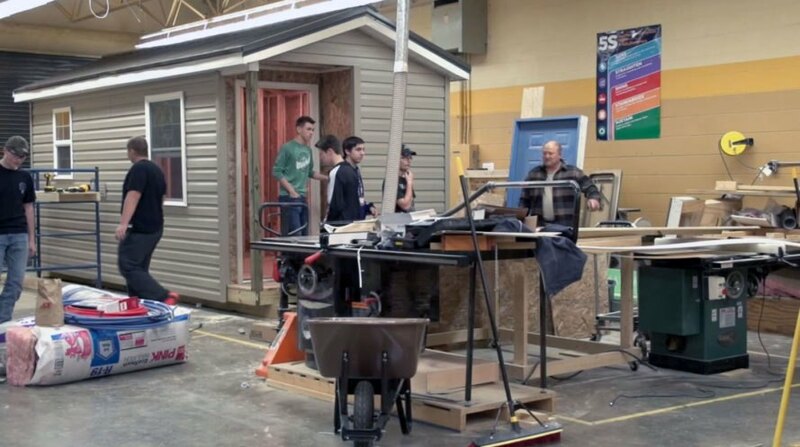 So students from across the state have gathered together to build compact, energy efficient tiny homes for victims of the flooding. West Virginia has struggled to provide adequate housing for those thousands made homeless by the storm. So high school students attending 12 vocational schools throughout the state are demonstrating that they may have a promising solution. The participating vocational schools, such as Carver Career and Technical Education Center in Charleston, traditionally teach practices such as carpentry and plumbing. A new, first of-its-kind partnership between the West Virginia Department of Education and the Greater Recovery and Community Empowerment initiative enables students to access hands-on learning to design and build homes for local flood survivors from concept to completion. Each unique tiny house is just 500 square feet. 15 homes have been built so far, thanks to funding from the state’s Board of Education and regional community supporters. All of the homes are unique and some are designed to be portable. Unlike trailers that are supplied by FEMA in post-disaster zones, each of the tiny homes will have individual design accents. Each home includes a bathroom, kitchen, living room and laundry room. The ground-breaking program has potential to be scaled to serve communities in other post-disaster zones. The education program not only equips students with a dynamic learning experience, but invites them to be active citizens in their community. The students work on the homes from concept to completion. 20 homes are expected to built this year. Each home is unique, and is about 500 square feet. The program has been referred to as "Tiny houses, big hearts."